Rare map offering an unexplored Pacific Northwest. An attractive 1724 map of the Western Hemisphere, or the Americas by the well-respected French cartographer Guillaume Delisle. 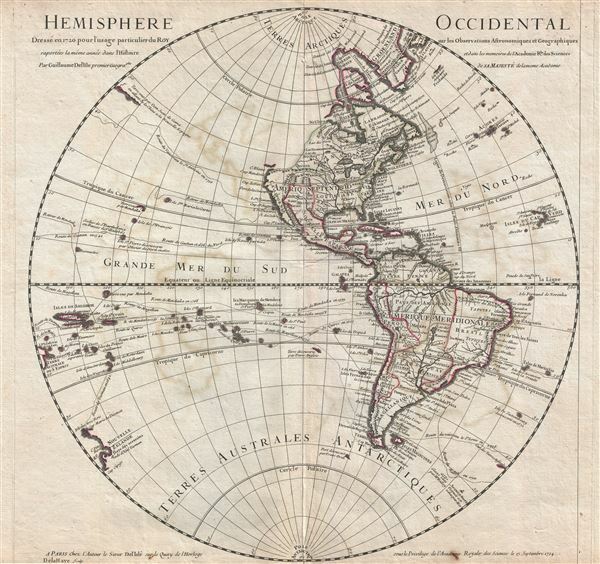 Centered on North and South America, this map covers the Western Hemisphere from Pole to Pole and from the New Hebrides Islands to the Cape Verde Islands. Delisle focuses on known shorelines and attempts to avoid positivist speculation, especially with regard to the unexplored reaches of the American Northwest Coast. The routes of prominent explorers including Halley, Quiros, Mendana, La Maire, Olivier de Nord, and Magellan, as well as the ships St. Louis, Gaetan, and St. Antoine. North America is centered on a massive Louisiana territory, itself focused about the great Mississippi River with its numerous tributaries, most of which flow from the vast unexplored territories north of Mexico (New Spain). The English Colonies are confined to a narrow coastal expanse stretching from Carolina to Boston Bay and extending inland no more than the Appalachian Mountains. Spain's claims on Mexico, here identified as Nouvelle Espagne, are similarly curtailed, with French claims to Louisiana extending westward as far as the Rio Grande (Rio del Norte) - thus including modern day Texas. Spanish claims are further truncated just north of Louisiana, leaving much of California, apparently, and the entire unexplored Northwest up for grabs. The setting here is not far from the truth, the French empire in North America being, during this period, at its apex. The French, through right of discovery conferred by explorers like La Salle and d'Iberville, as well as through trade alliances with various American Indian nations, claimed the Mississippi Valley and all of its tributaries, as well as all five of the Great Lakes and most of modern day Canada with the exception of the immediate vicinity of the Hudson Bay. Spain, with a French king on its throne, did little to contest French ambition in Louisiana, which left even the mineral rich interior of Mexico painfully close to the French border - a fact that would later lead to American claims on Texas and the Mexican American War. The northwestern part of America, still unexplored, is left blank. ...an island [of the Paraguay River] more than ten leagues [56 km] long, two or three [11-16 km] wide. A very mild land rich in a thousand types of wild fruit, among them grapes, pears and olives: the Indians created plantations throughout, and throughout the year sow and reap with no difference in winter or summer, ... the Indians of that island are of good will and are friends to the Spaniards; Orejon they call them, and they have their ears pierced with wheels of wood ... which occupy the entire hole. They live in round houses, not as a village, but each apart though keep up with each other in much peace and friendship. They called of old this island Land of Paradise for its abundance and wonderful qualities. To the north of the 'Island of Paradise' appeared the 'Puerto de los Reyes' which was considered to be a gateway to the Amazon and the Kingdom of el Dorado. Delisle's mapping of the South Pacific offers much of interest, including numerous hard to identify islands associated with the explorations of Mendana in 1595, Quiros in 1605, and Magellan in 1520. Identifiable islands including 'Terre decouverte par Davis Anglois,' which is most likely Easter Island, the Marqueses, and an oversized representation of the Solomon Islands. New Zealand, reflecting the discoveries of Abel Tasman, appears in embryonic form. Far to the west, at the border of the map itself, is another landmass labeled Terre Australe du S'Espirit, with several rivers but no western shore. Terre Australe du S'Espirit, in fact the New Hebrides, was mis-mapped by the near insane and zealously Catholic 17th century Portuguese navigator Pedro Fernandes de Queiros, who proclaimed that he had discovered the long speculated Great Southern Continent, or Terre Australis. Not to be confused with modern day Australia, Terre Australis was a vast theoretical continent that supposedly covered much of the southern hemisphere in Aristotelian symmetry with the bulk of Asia in the Northern Hemisphere. Another area of exceptional interest and great speculation are the islands at the northwestern border of the map identified as 'Terre vue par Dom Jean de Gama.' Jean de Gama is a mysterious 17th century Spanish explorer who rumors claim discovered islands rich in gold and silver northeast of Japan - a kind of Asian El Dorado. The Dutch navigators Maerten de Vries and Cornelis Jansz Coen were among the first navigators to sail into this unknown region in search of Gama's islands. Gama as presented here reflects preliminary sightings of the Japanese Kuril Islands in 1643 by de Vries and Coen. This map was engraved by Delahaye and published by Guillaume Delisle form his offices at Quay de l'Horloge, Paris. The first edition was drawn in 1720. The present example represents and updated and revised edition presented to and approved by the Acadamie Royale des Sciences on the 15th of September, 1724. It proved popular with this and subsequent editions being published and revised throughout the 17th century. Good. Original centerfold exhibits some wear. Lower and upper margins narrow, but intact. Platemark visible.